A construction professional himself, this owner assembled a "dream team" to build his custom home. The free-flowing activity areas of this sophisticated home illustrate the collaborative efforts of architect Robert Srote, custom builder Tegethoff Homes and 30-year design professional Brenda Jones of Design Expressions. 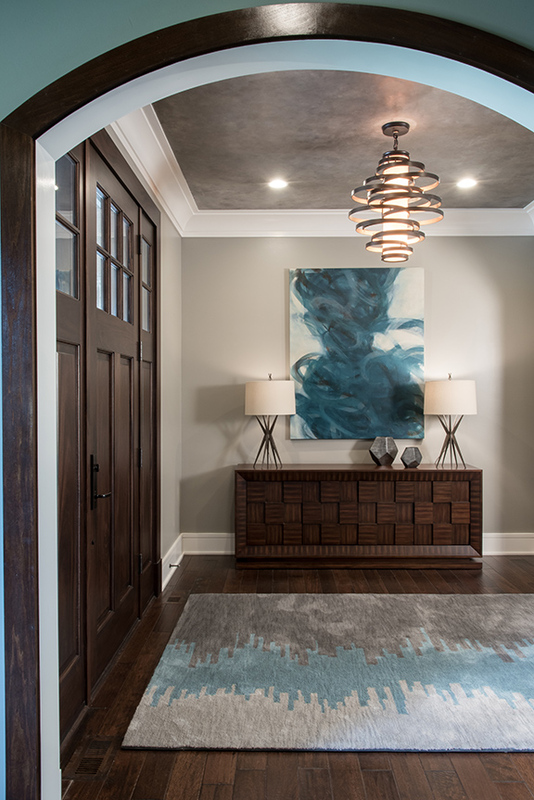 Viewed from the study, the entry foyer showcases a handsome, block-patterned zebra wood chest, contrasted with a swirling abstract canvas and pendant fixture from Metro Lighting. Leopard print accent pieces and a geometric custom wool rug add flair and movement to the great room's refined charcoal-and-aquamarine color scheme. 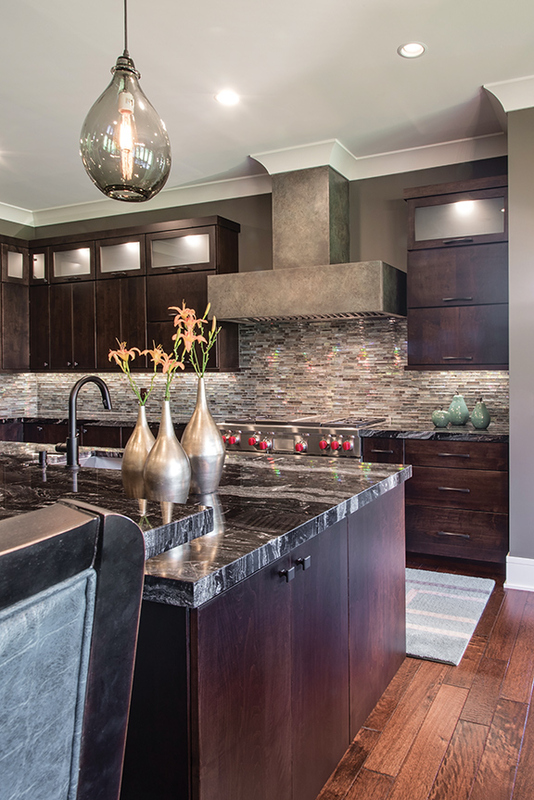 The kitchen's espresso-stained maple cabinetry and island are complemented by expanses of shimmering glass tile, Cosmos Supreme granite, and a massive range hood, faux-painted by Melodie Shocklee to resemble concrete. Spacious yet cozy, the fireside hearth room is a family favorite. 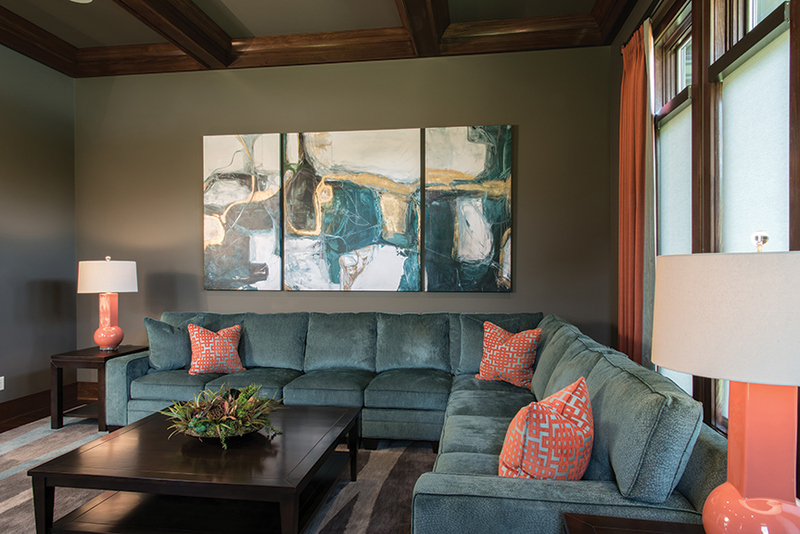 All custom-made, the plush sectional, coffee table and triptych art piece continue the home's color palette, with pops of orange and rust linking the room to the adjacent outdoor lanai. Open to the kitchen and hearth room, the dining area features "cutout" geometric chairs surroudning a contemporary table in cherry and mahogany veneer. Distinctively masculine, the master bedroom is furnished with a streamlined divan and contoured velour bed, both in smoky gray. 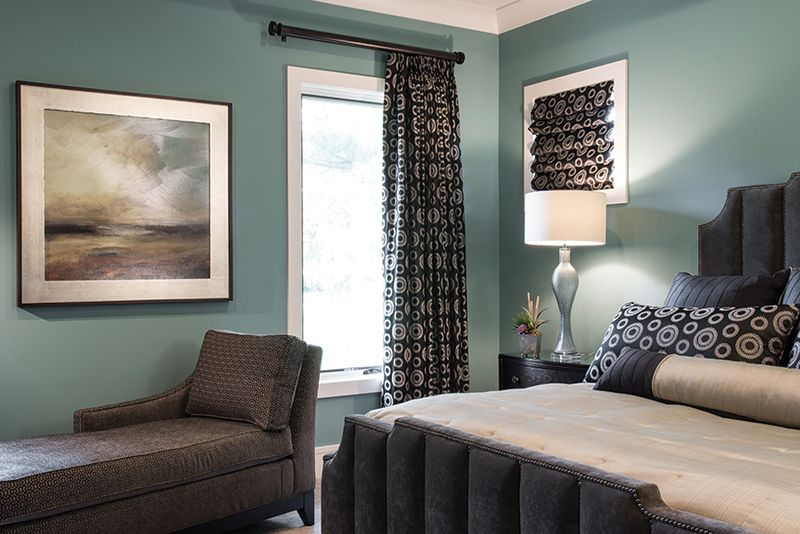 Geometric window treatments and accent pillows add visual interest. 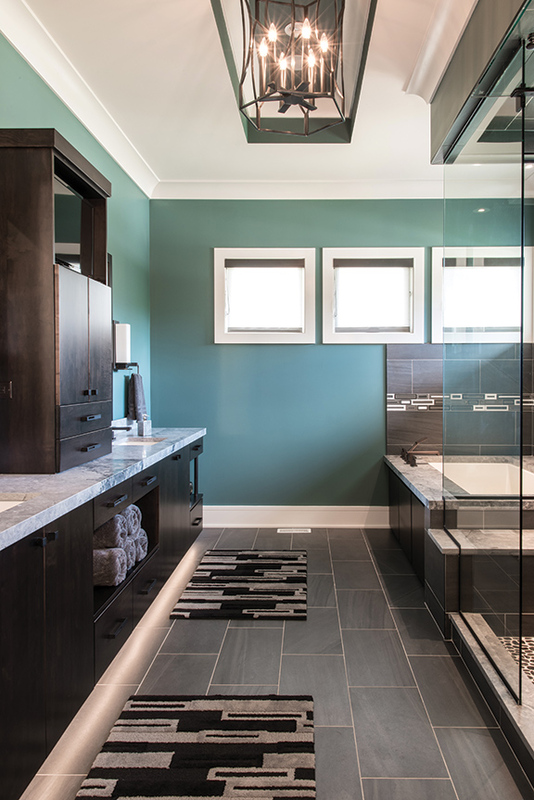 Oversize Milano porcelain tiles cover the master bath's heated floor; honed Montpelier Grey granite blankets the countertops and surrounds; and river rock ensures firm footing in the glass-enclosed steam shower. 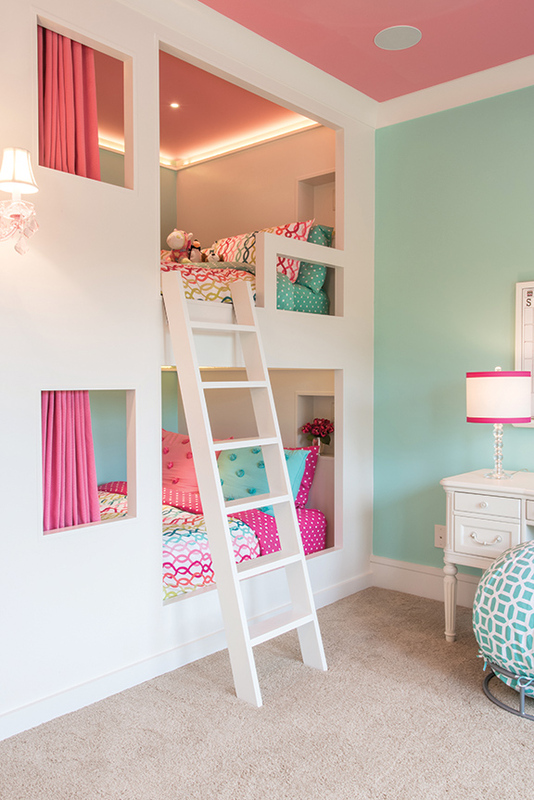 Designed by Jones and crafted by Tegethoff Homes' carpenters, the "princess" bedroom's double-decker sleeping alcoves include cubbies for nighttime essentials, with electrical connections for charging cell phones. Describing the owner of this stunning custom residence in Creve Coeur as “hands-on” would be an understatement. Co-owner and vice president of KCI Construction, a multi-disciplined large-project contracting company, he’d always wanted to build his own home and was an enthusiastic participant in every facet of its architectural and interior design. Architecturally, the homeowner envisioned a plan that was neither traditional nor starkly contemporary - instead, “comfortably modern.” He needed plenty of room for entertaining but, as the father of three preteen youngsters, wanted to create a “more intimate” family atmosphere for the interior. Topping his list of preliminary design instructions to Srote were an all-stone exterior, no formal staircase dominating the entry foyer, no soaring vaulted ceilings, distinct rooms as opposed to huge open spaces, and liberal use of color. Meeting the challenge, Srote designed a sophisticated, 5,200-square-foot story-and-a-half, with an expansive first-floor master retreat, four additional bedrooms on the upper level, four full baths and two half-baths, a fabulous three-season lanai at the rear, and an oversized three-bay garage with an interior stairway providing secondary access to the lower level, which will be finished in the future. Throughout the main level, 10-foot ceilings add volume while preserving the sense of intimacy, and eight clean-lined archways establish a motif that unifies the various living spaces. 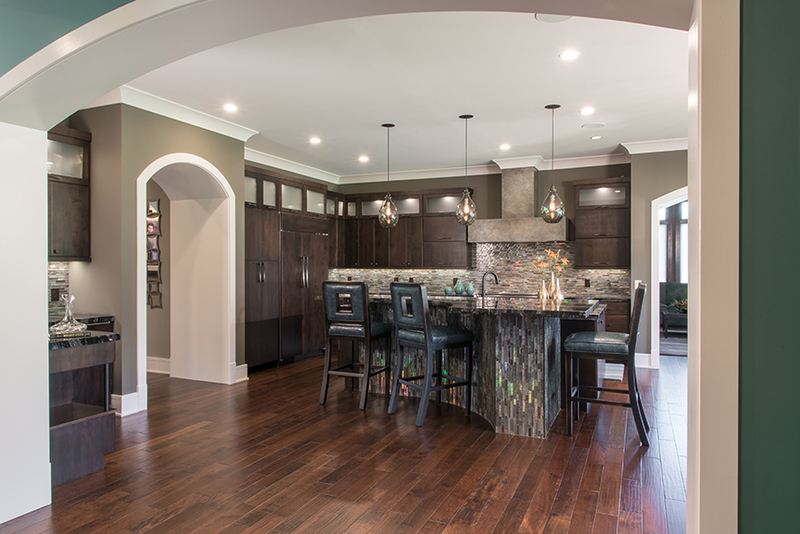 Under the meticulous supervision of custom builder Jim Tegethoff, Tegethoff Homes, construction began in early 2015, and the homeowner was fully involved in this process, as well. Drawing on his own professional expertise, he specified various components, including the eco-friendly permeable pavers that blanket the driveway, reducing runoff and filtering pollutants. For heating and cooling, he chose a cutting-edge VRF (variable refrigerant flow) system. Normally a commercial application, the system runs continuously at lower temperatures, providing substantial energy savings. Thoroughly familiar with the versatility of concrete, the owner called on Jeff McGowen of TrueCrete to craft the hearth room’s artisan concrete fireplace surround, outdoor kitchen and powder room sinks. Other unique aesthetic must-haves included “Mayer blend” limestone for the exterior; a built-in, 280-gallon saltwater fish tank; and delightfully customized bedrooms for each of the children. Except for a few personal items, all of the furnishings were purchased specifically for this home, and the interior design process was a collaborative effort, as well. The owner accompanied Brenda Jones of Design Expressions to select the flooring, colors, fabrics and window treatments, and the end result is a décor that is decidedly modern, yet wonderfully warm and comfortable. The home was move-in-ready by March of this year, and the owner’s pride is readily apparent as he leads a tour. From the foyer, the visual impact is immediate, with a view that extends across the great room to the open-air lanai and back yard. Crisp white trim and ceiling coffers emphasize the great room’s rich aquamarine and charcoal color scheme, leopard print accent pieces add a touch of flair, and suspended cabinetry and an 80-inch TV make this a truly contemporary entertainment area. Geared to today’s relaxed, less formal lifestyle, the adjacent dining room is both casual and elegant. Seating 10, this room overlooks the yard and is open to the kitchen, which is defined by a huge bi-level island. In addition to “anchoring” the space, the island has a curved overhang for snacking and houses two built-in dishwashers, a microwave, work sink and cabinetry. Granite countertops, espresso-toned cabinetry, ambience lighting, glass tile backsplashes, stainless steel Wolf appliances and a massive range hood fabricated to resemble concrete create a dynamic culinary environment. Another clever design element, the wet bar, with built-in wine cooler and icemaker, is integral to the kitchen and provides a pass-thru to the great room. Accessible from both the great room and the dining room, the spacious lanai boasts a wood-burning fireplace, fully equipped outdoor kitchen, TV and wicker-weave furnishings upholstered in a vivid rust-hued fabric. 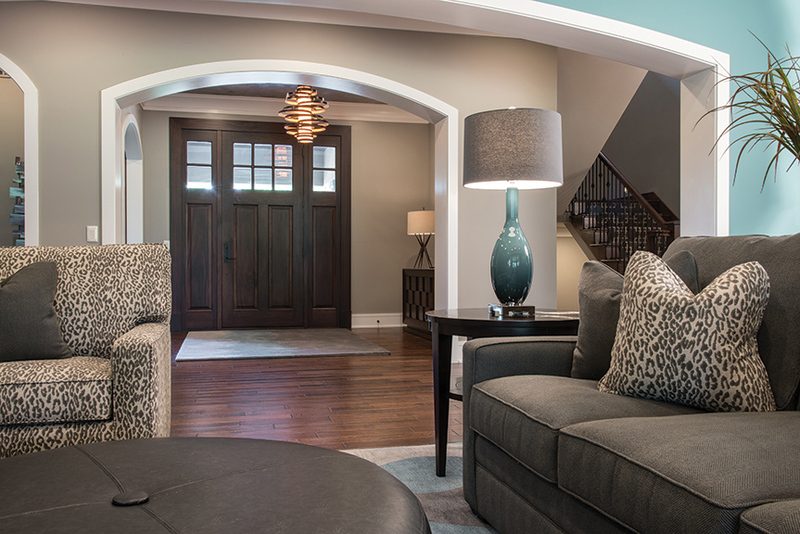 An archway from the dining room leads to the hearth room – the ultimate in comfort – decked out with a large flat-screen TV (one of eight in the home), and “well-used” by dad and the kids. 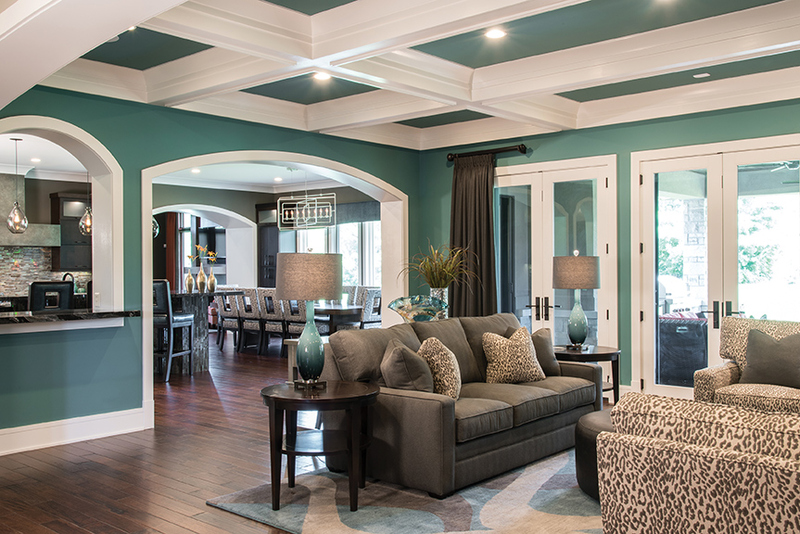 Here, the coffered ceiling rises to 12 feet, but warm gray walls, mahogany-stained woodwork and plush aquamarine seating ensure a cozy feeling. Surrounded by mahogany and concrete, the fireplace extends to the ceiling, and pops of rust in the stationary drapery panels and accessories create a visual link with the lanai furnishings outside the windows. In the opposing wing, the sumptuous master suite continues the color scheme with blue/green walls, white ceiling coffers and smoky gray upholstery covering the divan and contoured velour head- and footboards. As enticing as any spa, the master bath showcases a heated tile floor, glass-enclosed steam shower with river rock flooring, granite countertops and tub surround, designer cabinets by Perspective Cabinetry and, yes!, another TV. On the upper level, the children were encouraged to design their own bedrooms. 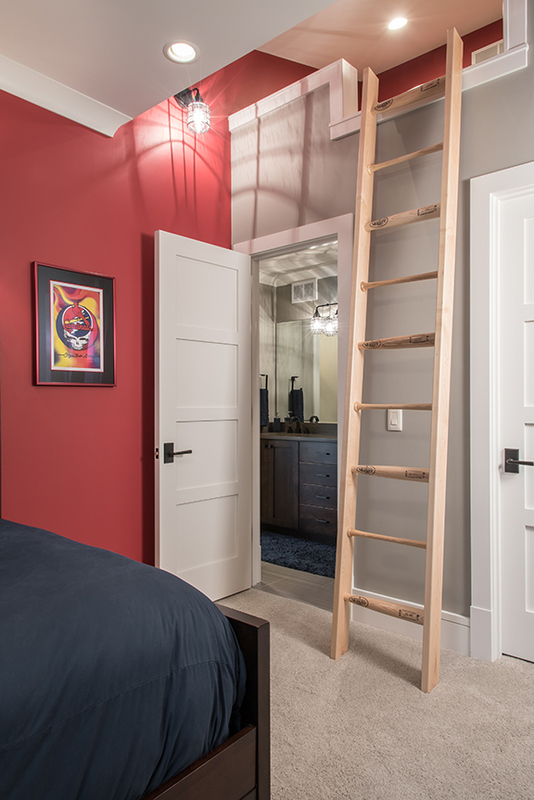 Sharing a Jack-and-Jill bath, one of the boys’ bedrooms features a ladder with rungs made of baseball bats that accesses a “hideaway” loft. In the other bedroom, each stone of the rock-climbing wall to his loft was positioned by this youngster himself. 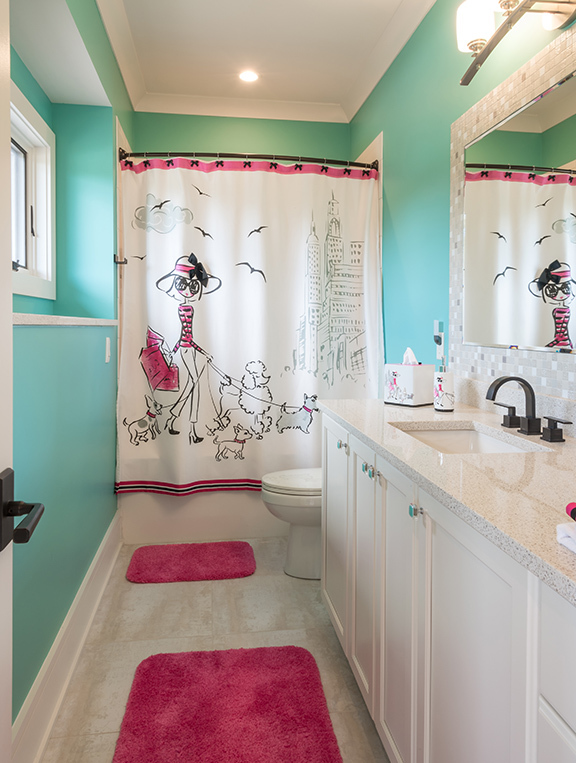 And a vision in pink and aqua, the “princess suite” has its own bath and was designed by Brenda Jones to the young daughter’s precise specifications, with privately curtained double-decker beds and adorable “girlie” accessories. It’s hard to imagine a home more perfectly suited to its occupants. From foundation to finish, this extraordinary residence illustrates what can be achieved when a skilled architect, expert custom builder and talented interior designer join forces, translating “pages and pages” of the owner’s expectations into a comfortable, thoroughly satisfying “manuscript” for living well.